Taipei, July 19 (CNA) Taiwan will not work with China to resolve the sovereignty dispute over the disputed Diaoyutai Islands, the Ministry of Foreign Affairs said Thursday, even though a recent poll shows that over half of the respondents support cross-Taiwan Strait cooperation strategies. "We will not work with China on the Diaoyutais dispute. We have our own policy," ministry spokesman Steve Hsia said in a routine press conference. In the face of a series of movements recently made by Japan and China to bolster their claims to the island chain in the resource-rich East China Sea, Hsia urged the countries involved not to take unilateral action that could destabilize the region. He also reiterated the government's stance that"the Diaoyutais are an inherent territory of the Republic of China." The latest flare-up in the dispute occurred several months earlier when Tokyo Governor Shintaro Ishihara said the metropolitan government was planning to purchase the Diaoyutais, known as the Diaoyutai Islands in China and the Senkaku Islands in Japan, from their private owners. Several Chinese activists have also said they are going to land on the archipelago as part of tourism development plans, according to media reports. 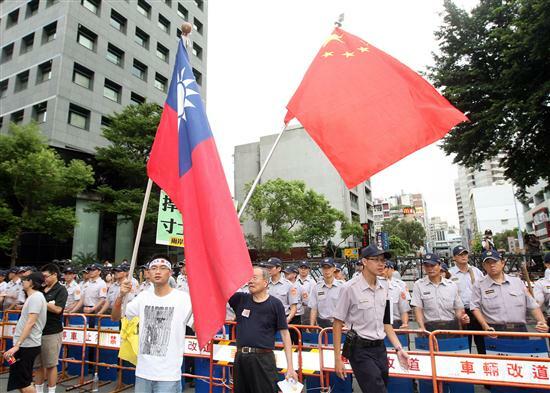 Hsia's remarks came as a poll conducted by the Chinese-language China Times revealed that 51.5 percent of Taiwanese respondents agree on joining hands with China to safeguard the sovereignty of the island group. About 85 percent of Chinese respondents held the same opinion, according to the poll, which drew responses from more than 3,000 people residing in various cities on both sides of the Taiwan Strait.